We started November in Moline, Illinois at the Quad-Cities Computer Society. We did a new seminar for them titled, “Travel the Globe with a Smartphone and Google Photos.” We wanted a reason to show off some of our Europe photos and to teach how we used Google Photos to create that photo album as we went. When we left Illinois, we had just a couple days to get back to Florida. In Gainesville, Jim put Chris on a plane to Mountain View California for the Google Top Contributors Summit, then he attended a Roadtrek rally at Payne’s Prairie State park. When the Summit was over, Jim was waiting at the Gainesville airport at midnight to collect me. We decided to just stay in the airport parking lot for the night. We so enjoy the greater flexibility that traveling in the Roadtrek gives us! No way we could have parked the big RV there. From there it was on to home, getting settled in for the winter, and upgrading our webcasting studio to use green-screen effects. See our November photo album for more pictures, and our Blog for the rest of the story. Thursdays we go “Live at Five” on Facebook Live to discuss the week’s class and answer questions from viewers. 5pm ET. December – we’re in Fort Lauderdale, Florida. Home for the holidays! We are available for speaking engagements in the local area. Here’s our speaking request form. What is blocking access to WiFi? 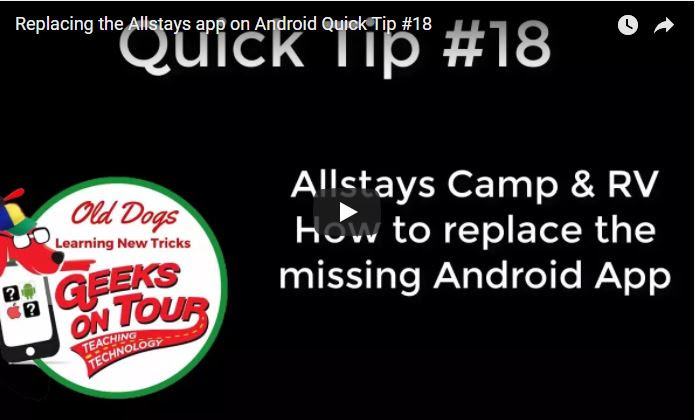 It was very distressing to learn that the essential Allstays Camp and RV app had been removed from the Google Play store. With a few extra dollars and a little bit of know-how, it now works better than ever on my Android devices. The first week of our trip I was in a writer’s workshop, and there was little to no Wi-Fi available. I used my Chromebook, offline, to do all my writing. I used Google Docs that is built in to the Chromebook to do the writing. Read the article and watch the video about my Chromebook. Taking a trip? Prepare your phone for photo-taking before you go. This article explains exactly what to do before you leave so that your phone is ready to take all the photos you want. 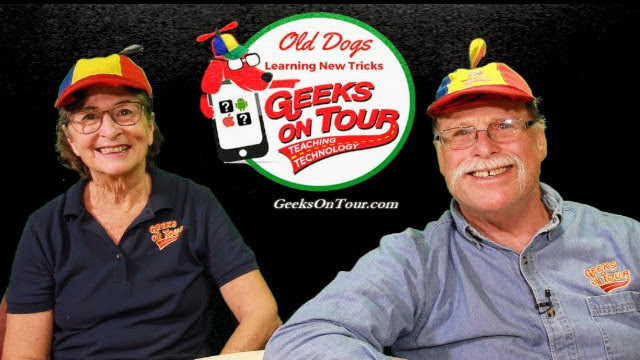 Have you learned something from Geeks on Tour? If so, we’d love to get a review from you. Click on the Facebook or the Google link below. First you’ll be asked for a rating by stars – 5 is appreciated! Then, please write some comments. Did you learn from us in person? or from videos on our website? Do you watch our weekly What Does This Button Do show? Do you learn from our newsletters? How has your use of technology improved? We’re updating the website all the time. There are nearly 1,000 articles, 500 videos, and 140 What Does this Button Do Episodes. How do you find what you want? Here are some tips on how to get to the best stuff!